2011 www.imperialgunnery.com new pictures / updates thread - User Submissions Tracker Thread! 04/01/2011 LL CCP Comm - Added - Dan Submission - 1 Point Dan! Dan this is the Updates and Submissions Tracker thread for the www.imperialgunnery.com 2011 User Contributions Competition! Here is the thread regarding the competition - Vintage SW prize for the ultimate winner! 08/01/11 - Teebo Axe REPRO Added - Note this REPRO is good quality and its cast in plastic (not painted) it also floats in water where as Original Teebo Axe's Sink! 08/01/11 Yoda Snake REPRO V1 Added! Note we are looking for high quality pictures of ALL Original Yoda Snake Variants this is a big gap that needs to be filled and a great chance for someone to get some points on the board in the competition! Jay - I still need to get you that Nikto staff sent off to you. I'll try to remember this weekend! Good work on the new additions - I had no idea that the repros for 12" range were so like the true accessories! Yeah some of the 12 inch REPRO's are very close to the Originals! Nice one AJ i think its time to have a miscellaneous REPRO parts section added to the site as it seems REPRO's are been made for almost everything these days including those REPRO storm trooper figures. 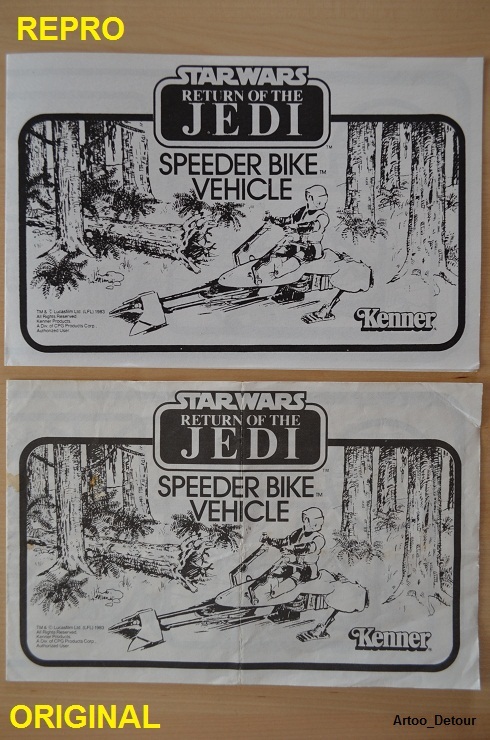 Repro Kenner Speeder Bike Instructions. Exact same dimensions as Kenner original. Paper is slightly heavier. Ink is blacker than original and poorly distributed with numerous air holes and faint bleeding. Lettering on text is not as sharp as original. MTV7, Mobile RLC, Tripod Laser Cannon. I didn't know there were also repros for the instructions!! Unfortunately repro instructions have (to my knowledge) been readily available on eBay UK for well over two years. However, most of the ones I've seen have been advertised as repro in the listings, so hopefully few collectors will be caught out! Some of them are very obvious as they are printed on the wrong sized paper & / or lack the fold lines seen in the originals. Subject: Re: 2011 www.imperialgunnery.com new pictures / updates thread - User Submissions Tracker Thread!